Our kitchen table needed a little brightening up for Valentine’s Day. I searched through my fabric stash and found the aqua pieces of Sew Cherry by Lori Holt. I love this fabric!! 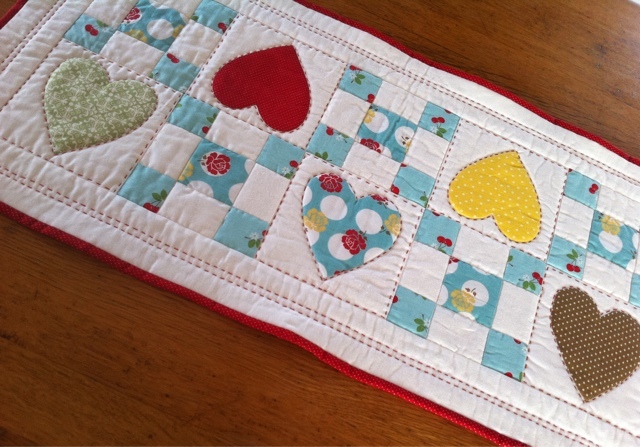 Then found a few scrap fabrics that coordinated. I love it when I can just shop my stash! 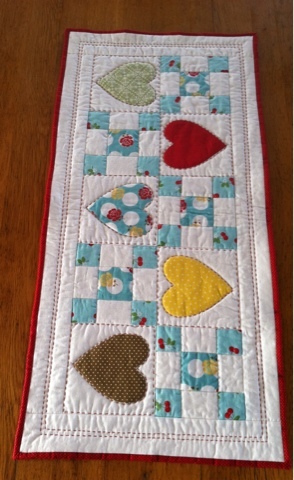 The table runner is made with an uneven nine patch blocks and heart appliqué blocks. This was quick and easy to put together. Here is a tutorial so you can make a Candy Heart Table Runner too. Cut a piece of paper 6 1/2 inches square. Fold in half and draw half a heart on the fold. Make sure that you leave enough room for seam allowances. 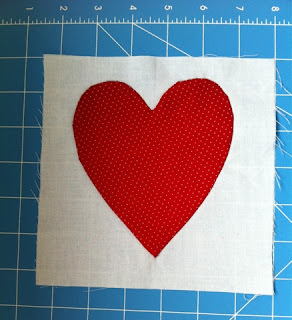 Cut along your drawn shape to make a heart. 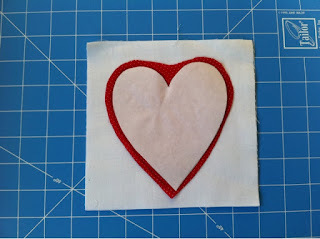 Use your paper heart as a pattern and appliqué your scrap hearts to the center of the white blocks. I used needle turn appliqué. 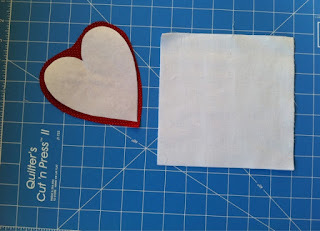 I traced the heart on to freezer paper then cut it out and ironed it to the right side of my scrap fabric. Shiny side down. 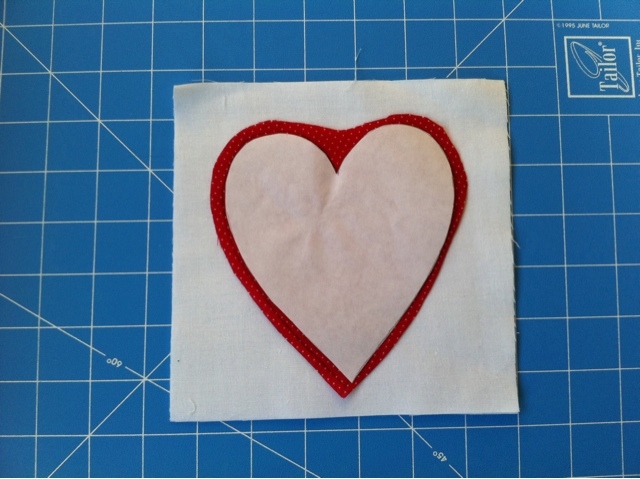 Then traced the heart shape into the fabric. 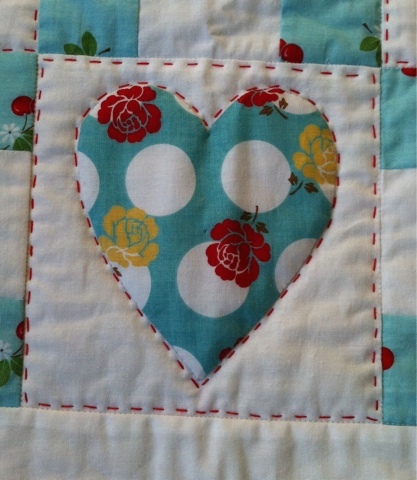 Clipping the curves I stitch the hearts to the blocks. 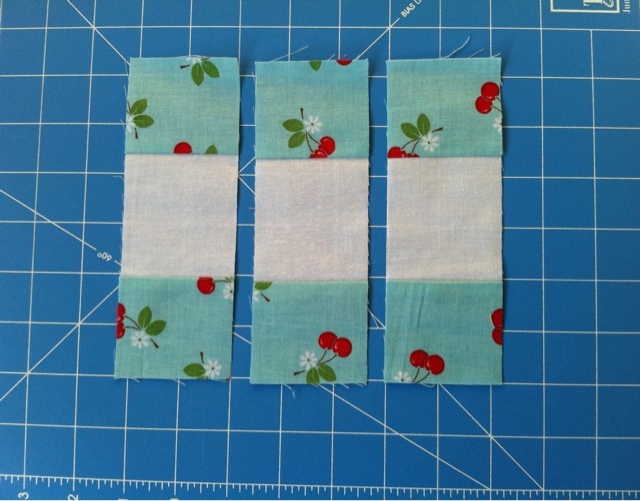 For the first strip set sew 2 1/4 inch white strips to both sides of the 3 inch color strip. For the second strip set sew 2 1/4 inch aqua strips to both sides of the 3 inch white strip. From the first strip set cut 5- 3 inch blocks. From the second strip set cut 10- 2 1/4 inch blocks. 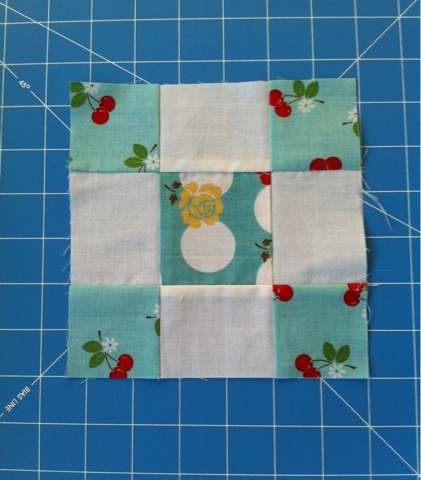 Sew a 2 1/4 block to either side of the 3 inch block to make an uneven nine patch block. Make 5 uneven nine patch blocks. Should be 6 1/2 inch blocks. 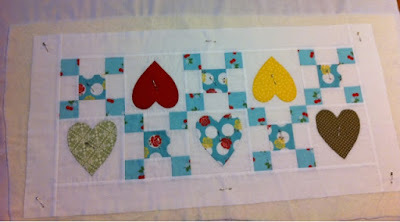 Now alternate the heart blocks and the nine patch blocks so that you have two rows of 5 blocks. Sew together to form rows then sew your rows together. Add borders. 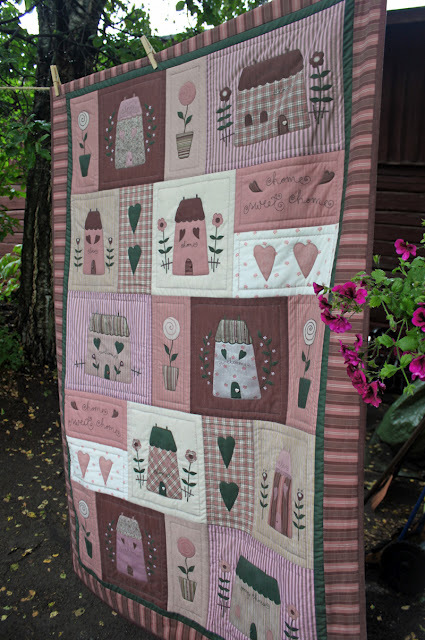 Make your quilt sandwich. 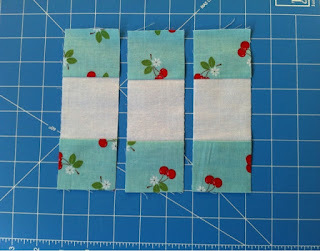 I machine stitched in the ditch between all the blocks and in the seams if the uneven nine patch blocks. Then I used floss to stitch around the hearts and in the border. All done!! 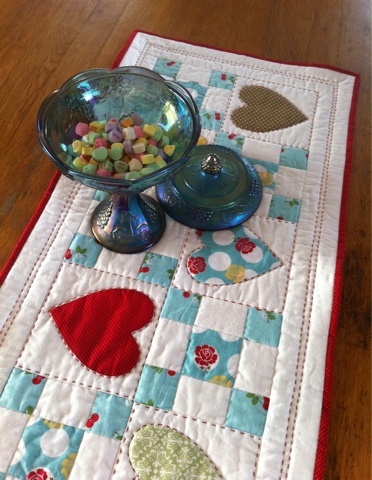 A bright fun Candy Hearts Table Runner!! 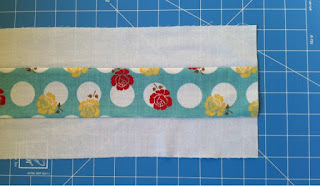 Today it is icy and snowy outside and I plan to make some mug rugs. A mug rug is a little larger than a coaster and can be used for mugs, snacks, a spoon, or even plants. I have seen so many cute ones and have found one with a tutorial. My plan is to start with that one and then work my way onto making others. This the link for the video http://youtu.be/Z43J5S45FNQ or you can just click on the arrow in the picture.